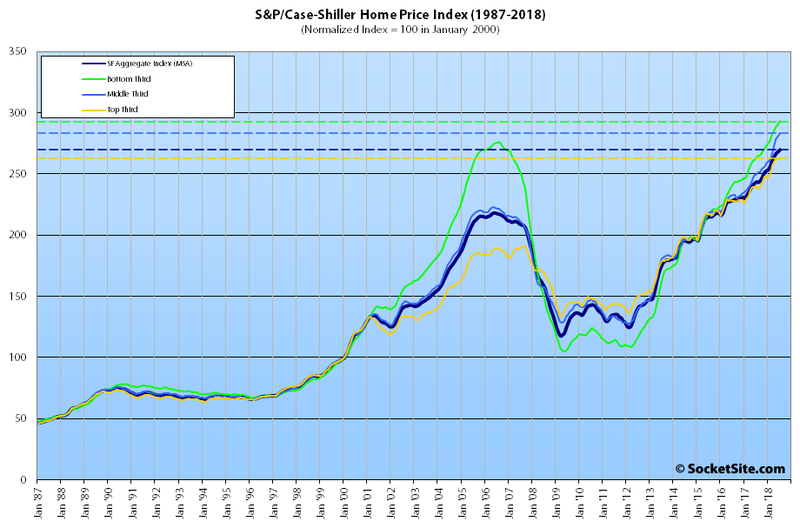 The S&P CoreLogic Case-Shiller Index for single-family home values within the San Francisco Metropolitan Area – which includes the East Bay, North Bay and Peninsula – inched up 0.6 percent in July to a record high and is running 10.8 percent higher on a year-over-year basis but with uneven gains across the broader market. 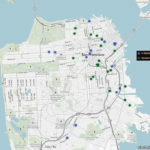 Having inched up 0.9 percent in July, the index for the bottom third of the Bay Area market is now running 11.1 percent higher versus the same time last year while the index for the middle third of the market is running 13.2 percent higher having inched up 0.9 percent in July as well, while the top third of the market inched up 0.3 percent in July and is running 9.5 higher, year-over-year. 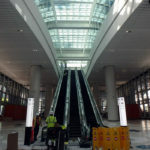 As such, while the index for the top third of the market is now 37.3 percent above its previous peak which was reached in third quarter of 2007, the middle tier is running 27.3 percent above its previous peak set in the second quarter of 2006 and the index for the bottom third of the market, which had dropped over 60 percent from 2006 to 2012, is now 6.3 percent above its previous high water mark. 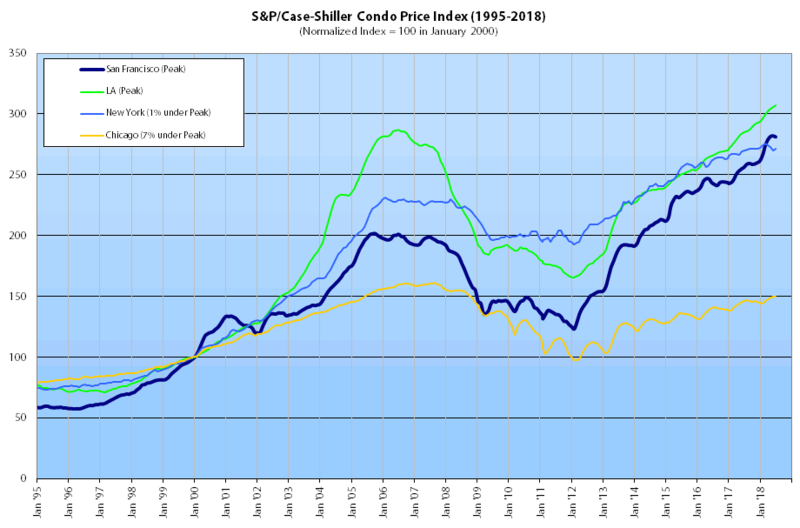 And while the index for Bay Area condo values slipped 0.3 percent in July, it remains 9.6 percent above its mark at the same time last year and 39.4 percent above its previous cycle peak in the fourth quarter of 2005. No real surprise, other than perhaps the magnitude of the continuing record highs. I’d be surprised if this continues much longer. Some headwinds appearing. I would have expected a bigger impact of interest rates and/or tax law changes than what appears in those numbers. At least I would have expected the bottom third to show a decline or markets like Las Vegas to show a decline. Buying a home is a lot less affordable today than a year ago for a buyer with a mortgage and paying a high tax rate. If you’re looking for the leading, versus lagging, indicators of local market strength (which actually started shifting in 2015), see: Bay Area Home Sales Slip to a 7-Year Seasonal Low while the Inventory of Homes for Sale in San Francisco [has hit a] 7-Year High. I was thinking the same thing. Apparently I was wrong as I keep seeing high closing prices for some small starter homes in middle of the road neighborhoods. Amazing to see. I am sure more friends will move away because as they were saving for a down payment the house prices have gone up significantly in recent years. That green line separating from the pack is not a good sign in terms of a bubble indicator. I do wonder how the changes in SALT will affect the market next year. I have spoken with a number of married dual-income home-owners who had no idea their combined deductions would be capped at $10,000 next year – could be an interesting spring. You mean they thought it would be $20K because they were married, or they just weren’t aware of the change at all (and you’re aware, I assume, that the standard deduction for married is now $24K…not that will matter much if you have a $98,356 SALT tab) ?? Not my income bracket, but if a person had that much in SALT deductions wouldn’t the itemized deductions be phased out anyway? Yeah, with the lower federal rate, and basically the elimination of the AMT and Pease limitation, my accountant says I’ll come out ahead with the new tax laws. They’ll hit people differently, but you can’t just say “lower SALT deduction = less after tax income.” It gets really complicated. Correct. AMT and Pease capped the previous benefit for most CA taxpayers. Thanks for posting this. Many (all?) high income households do better under the new tax structure. It was a GOP bill after all. Wish more folks got that. Don’t know if all, but most people paying tax will pay less under the new law. High income earners in states with low state taxes will benefit the most, as they will get the tax cuts but not loose any deductions. I am not saying that the tax cuts are a good thing – but it is what it is, and most complaints about the tax reform is people who feel their tax cuts were too small. I have not heard of any benefits to the large portion of the population (low income) that don’t pay federal income tax. Perhaps; as I said most people – there may be unique examples as yours in the top 5% earners that don’t get a tax cut. The tax code has become very complex as each congress/president tries to make changes for their favorite contributors. Yes, but advancing this argument sounds like both-sides-ism. One US political party does this much, much, much, much, much more than the other. The historical evidence is long, open and voluminous. The Rs made an interesting play this time where they adjusted the code such that some upper-middle class earners pay more (if they relied heavily on SALT and mortgage interest deductions to offet their large tax bills). This allows the press to report accurately that some folks who seem well off pay more. Meanwhile those of us paying the AMT and/or in the top bracket are in for some decent savings. I have seen very little reporting on the effect of higher AMT thresholds and lower rates for the top bracket. Savy move by the Rs, they satisfied their traditional base with some tax cuts and their new lower-class base with some press on how upper-middle class folks were taking it on the nose. Well, most deductions in the revenue code has some type of justification: people who have large out of pocket medical expenses can deduct them – seems fair enough. If you have a large loss from fire, flood etc. there is a deduction. If you have expenses pertaining to your work or business they are deductible as they are necessary to create the taxable income in the first place. Deduction for mortgage interest is to increase the number of people who can afford their own residence – having the deduction on mortgages above 750K can look like you are kissing up to your wealthy donors. And deducting state taxes from federal taxes – what is the justification for that? Living in California I gladly take it, but why would you agree to such a deduction if you lived in a state where the revenue was collected in other ways? Anyway, the tax reform may have a small negative effect on real estate transactions in high price/high tax states i.e. the Bay Area, but the run-up in prices since the great recession does not seem sustainable with or without the tax reform. I am not sure how much wages have increased over the last decade, but I am confident that home prices were out of touch with reality in 2006. Is an increase of 0.9% (bottom two tiers) really “inching up”? as it translates to double digit annual increases.